possibly active on Earth in what would become Northern Ireland. Powers/Abilities: Krakkan is an entity who grants magical power to those who invoke him, typically in spells. Krakkan typically grants power to those invoking the Chains of Krakkan, which generally serve to entrap and hold others, often preventing them from utilizing their powers. 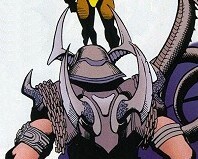 Loki defined Krakkan as "an odd, tedious and particularly smelly entity". History: Krakkan's origins are unrevealed. He was likely worshipped at some point on Earth, though whether he is closer to god or demon is open to speculation. (Iron Man III#22 (fb)) - <Millennia ago> Eight great mystics gathered, and a disagreement arose as to which was the most powerful. To settle the argument, they entered into the Wager of the Octessence: Each created a totem, with each totem holding a fraction of its creator's vast power and possessing the ability to transform the first human who touched it into an Exemplar, a living embodiment of that power. (Thor II#17 (fb) - BTS/Avengers III#25 (fb)) - Krakkan placed his totem, the Kestrel Key of Krakkan, within a cavern in what would become the Northern Ireland. It was probably in the days that Krakkan walked the Earth, that Loki knew of his existence. (Thor II#17 (fb)) - <Modern Era> The Kestrel Key of Krakkan attracted Bridget Malone to the hidden cavern. She touched it and was transformed into Krakkan's Exemplar, Conquest. Comments: Name and use in spells created by Roger Stern. Form revealed by Kurt Busiek & Roger Stern, Sean Chen, Rob Hunter, Rags Morales, Nelson & Eric Cannon.. Writers say "millennia" all the time, as if they were really an ancient time. It's possible that it was hundreds of thousands of years ago, or even millions or billions. Entities can steal energy from an unwilling source by consuming the source entirely or by draining a portion of energy from the source. This exchange is one-way. The entity takes energy. Entities can be given spiritual energy unconditionally in the form of worship. Statements of worship come in the, "I believe..." format. Worshippers may also petition for favors, etc., but this form of prayer is an affirmation of their belief and of the entities existence. The worshippers expect nothing in return. This exchange is also one way. The entity is given energy. An entity may grant energy to a petitioner in answer to an invocation or prayer. The mere act of being asked gives the entity power and so to encourage this action, some spiritual beings will grant power to an individual who invokes their name in the proper way. The entity may chose to ignore the request. I would theorize that the spiritual energy or "mystic potential" present in the petitioner plays a part in how often requests are granted. The invocation or prayers of an individual who has large amounts of spiritual energy would provide the entity with a more enticing exchange and they would be more inclined to answer them. Occasions in which Krakkan's power was used by mystics for their spells. I'm sure there are some not included here. Please let me know what I've missed, preferably specifying the issue, the situation it was used in (by whom, against whom, accomplishing what), and then quote the spell exactly. Doctor Strange II#45: Clea conjured the Chains of Krakkan. let my foe be ensnared by the Chains of Krakkan! By Krakkan and Pohldahk and Mehroth unbending. Let all barriers fall... 'fore this one I'm sending! Doctor Strange Sorcerer Supreme#24: Under Dormammu's request, Umar swore to hold her vow upon the Enchanted Chains of Krakkan. Defenders II#8: Strange tried to conjure the Chains of Krakkan to hold the Hulk but the spell was not completed. The Order#2: Strange conjured an enchanted door to pass through a wall. Join thy powers now in chorus. that those within may quail before us! to entrap my enemies' hands and brains! with this world I now defend. back to your plane: aftermath! Lend your power, great Krakkan! With the rage you only can. from his limits to be freed!